Freida Pinto is back on the scene and today(January 23rd) in London, she attended the premiere of her latest film 'Love Sonia' at Curzon Bloomsbury. 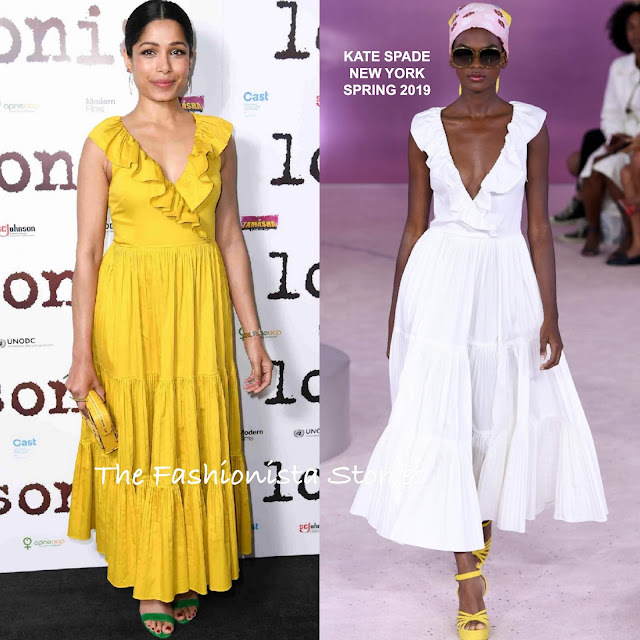 Turning to KATE SPADE NEW YORK, she wore the brand's SPRING 2019 chartreuse poplin ruffle tiered dress and carried the 'Celia' vibrant canary clutch. On the runway, Freida's dress was shown in white, with a deep v-neckline. However I prefer the color that she is wearing and the shorter neckline worked in her favor. While black or metallic heels could have been a safe choice, I loved that she opted for green hue sandals. Her look was topped off with a center part ponytail, a pink lip color and gold earrings.